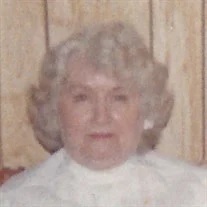 Louise Prince, 94, lifelong resident of Chickamauga, departed this life on October 8, 2018. She was born June 18, 1924 to the late Issac R. and Lula Parris Potter. She was also preceded in death by her husband, Ira T. Prince; several brothers and sisters; and grandson, Miki Ellis. Louise is survived by her children, Wayne (Wanda) Prince, Ira Phillip Prince, Michael (Victoria) Prince and Dianne Prince Ellis; grandchildren, David Perry, Cassie Prince, Jennifer Prince (Justin) Clements, Ryan (Katlyn) Ellis, Brandon Hendrick, Christopher Hendrick, Breana Hendrick, Daniel Hendrick, Joe Hayes Prince, Hailey Prince, Michael Prince, Jr. and Jessica Case; great-grandchildren, Courtney Perry, Jackson Clements and Kali Crawford Ellis; and several nieces and nephews. A graveside service will be held at 2 p.m. on Thursday, Oct. 11 in the Chickamauga City Cemetery. The family will receive friends from 4-9 p.m. on Wednesday and prior to leaving for the Cemetery on Thursday.